I have decided that adding this page might make it easier to find specific instructions without having to sift through all my posts. It will also make it simple for me to drop in those “ah-ha” moments, without having to make another post. 1. Just the other day I found myself having to remove a few stitches in the lace pattern I’ve been creating, and discovered that if I turned my work around to the backside, I didn’t have to peek over the top to make sure I was getting all of my “k 2 tog’s” on the needle. So now, I always take off a knit row from the purl side, and a purl row from the knit side. What a difference it made. Wow! Now I can see every bar, YO, and loop. Thank you God!!! 2. Are you loosing your grip lately. I am. It seems as we age things seem to fall through our fingers, or in my case the yarn is sliding through my hands a bit faster than I’d like. 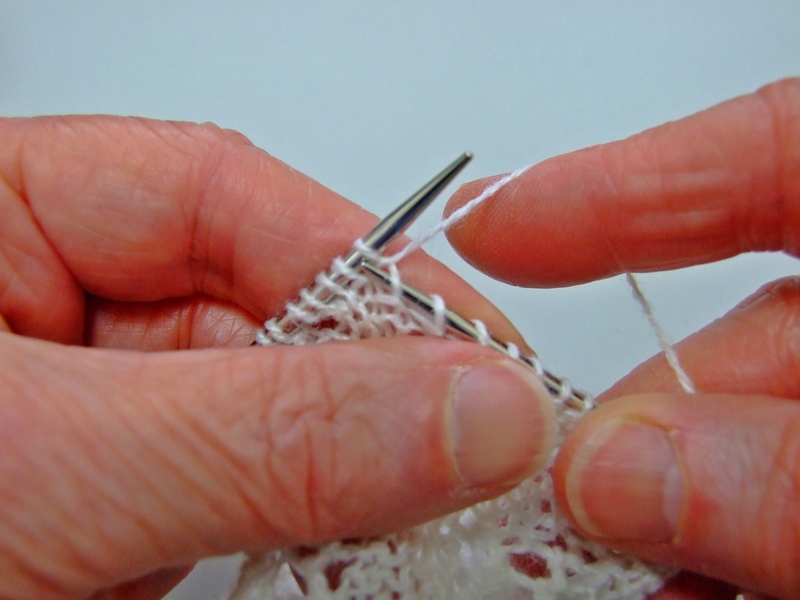 So…… to solve the problem I have discovered that rubbing hand cream into my hands before I start knitting really helps. ! Make sure you rub it in good. Try it! I might just work for you. 3. I have discovered that even when you buy pre-washed wool to knit your socks with it will still shrink. What to do? I now make my socks to just fit my foot without stretching too much. After they are washed and dried in a low drier a couple of times, they are perfect. From that point on I wash them by hand and let them air dry. What a great tip! Would you mind if I copy it and share it with the members of Knitter’s Paradise forum? I would give you full credit, and can post a link to your site if you approve…. Will, of course, wait to hear from you. Terry- Share away! That’s why I posted this tip. Thank you for spreading the word. I use a soy lotion bar as it won’t stain or lotion the yarn. I found it at the quilt stores.